WOW! The temperatures are really starting to drop around here, and that means soup is on the menu more often. I honestly forget how the topic came up, but a friend of mine was asking me about leek recipes for her brother, and I told her that Creamy Leek and Potato Soup was one of my favorites. To being you will need to prepare your leeks. Remove the long green leafy part and the root end. Then, beginning and the bottom of the green side, cut the leek in half. Then cut each half into slices. Leeks often have a lot of sand and dirt in the layers, and you don't want that in your soup, so you will want to place the slices into a bowl of water. All of the grit will fall to the bottom. And you are left with yummy leeks! While the leeks are soaking you can chop the potatoes, celery, and garlic. Once you have all of your vegetables prepped, place a soup pot over medium/high heat and add 2 tbsp. of the stick of butter. Allow the pot to get hot and the butter to melt. Once the butter has melted you can add the leeks, but be sure to drain them first. You will cook these just like and onion. They should be soft and translucent. Oh, and you will want to be sure to season with salt and pepper. Now you can add the celery. Cook that until tender as well, 1-2 minutes. Add the garlic and cook until you smell it coming from the pan. Now you can add your potatoes. I know you are thinking that's a lot of salt, but remember potatoes are very bland and require a little heavier seasoning. This is what is going to make your soup nice and thick. I added a 1/4 c because I like my broth to be a little more on the brothy side, but if you are more of a thick soup lover bump it up to a 1/2 c.
Now you will need to stir everything around so that everything is coated with the flour and seasoning. Now you will add the chicken stock. Stir everything together and bring to the soup up to a boil. Once at a boil lower to a simmer, cover, and cook for 10 minutes until potatoes are tender. After 10 minutes add the rest of the stick of butter. This is going to give your soup a nice rich flavor. A cup of half and half. Stir it all together, let it simmer for 10 more minutes, taste for seasoning, and you are ready! Oh yum! Look at that! 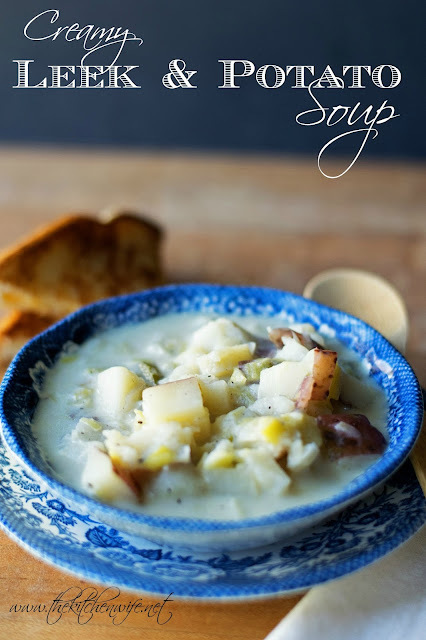 Tender potatoes, al dente leeks, creamy, flavorful broth. What more could you ask for? 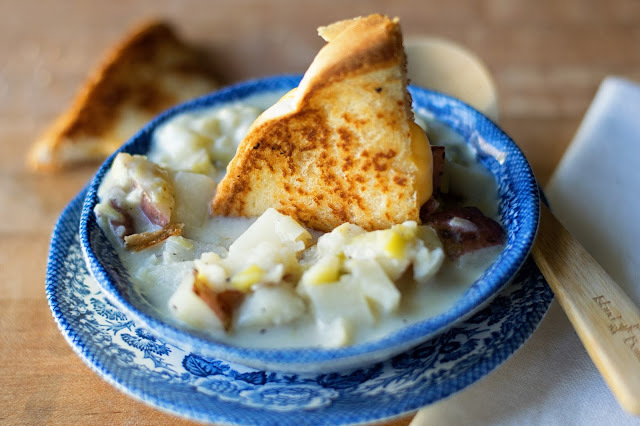 The Creamy Leek and Potato Soup is perfect with a nice grilled cheese and is ready in 30 minutes. Perfect for a busy weeknight meal to warm the soul. So when the air starts getting crisp in your hometown warm up your soul in the kitchen with this soup! Then, beginning at the bottom of the green side, cut the leek in half. Then cut each half into slices and place into a bowl of water. Place a heavy bottom soup pot over medium/high heat and add 2 tbsp. of the stick of better. Allow the pot to get hot and the butter to melt. Add the leeks to pot, season with salt and pepper, and let cook until soft and tender. Next add the celery and allow that to get tender as well. 1-2 minutes. Add the potatoes, salt, pepper, seasoning salt, and flour to the pot. Toss it all around until everything is coated. Add the chicken stock. Stir and bring o a boil. Once at a boil, lower to a simmer, cover and cook for 10 minutes. After 10 minutes add the rest of the stick of butter and half and half. Simmer for 10 more minutes, taste for seasoning and make any adjustments. This looks really yummy! My mom used to make a leak and potato soup but this sounds easier than hers. Thanks for sharing!